Heat gas or charcoal grill for indirect heat. Fold thin end of each pork tenderloin under, so pork tenderloin is an even thickness; secure with toothpicks. In shallow bowl, mix chili seasoning mix with oregano. Brush pork tenderloin with oil; sprinkle with seasoning. Grill over unheated side of grill and 4 to 5-inches from medium heat for 25 to 30 minutes. Add pineapple to grill for last 2 to 4 minutes of grilling. Meanwhile, in a small microwavable bowl, mix barbecue sauce and cumin. Cover; microwave on High 30 to 60 seconds or until hot. 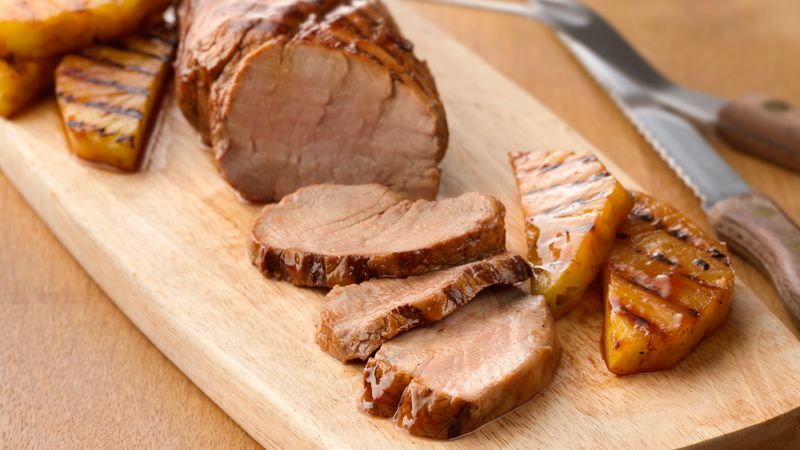 Brush over cooked pork tenderloin and pineapple. Variation: Try with 1 1/2 lbs/750 g chicken breasts or thighs.